Invigorating and HerbalJuniper berry and aromatic garden sage open to a heart of fresh-cut rosemary and revitalizing eucalyptus. 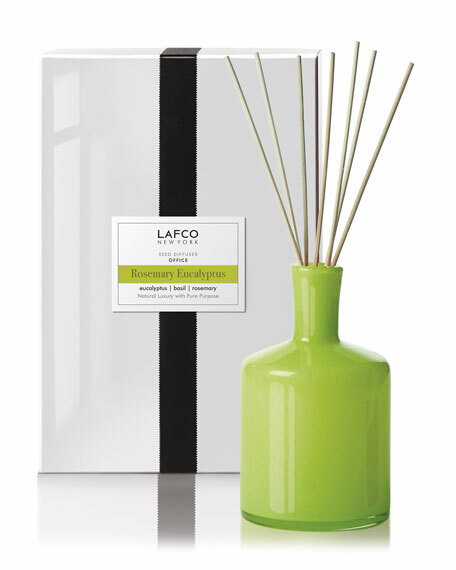 Creamy patchouli and spicy elemi create an earthy, woody grounded base. Hand poured in the USA with up to a 90 hour burn time and delivered in a hand-blown art glass vessel, LAFCO candles are naturally luxurious. Essential oil based fragrances deliver a natural and true scent. Highly concentrated fragrances fully and evenly scent any room. Unique solid soy wax and 100% cotton wicks provide a clean, non toxic burn. Crafted with premium quality fragrances and delivered in a beautiful handblown art glass vessel with hand-cut reeds, our diffusers fill your home with luxurious fragrance. *Essential oil based fragrances deliver a natural and true scent. Highly concentrated fragrance oils are specially blended to continuously scent large spaces for up to a year. Large, natural reeds allow for a robust and steady release of fragrance.